Members of the University and College Union at 16 colleges will walk out for two days starting January 29, in an ongoing dispute over pay. The union has also written to the education secretary Damian Hinds urging the government to provide extra funding for staff who feel “undervalued and severely underpaid”. “UCU members are being forced to take strike action to secure fair pay because they have had enough of watching their pay being eroded while their workloads increase,” said Matt Waddup, the union’s head of policy. Today’s announcement follows a ballot held at 26 colleges about potential strike action that closed shortly before Christmas. Although all 26 voted overwhelmingly in favour of strikes, just 10 met the tough 50 per cent threshold required for them to take action. 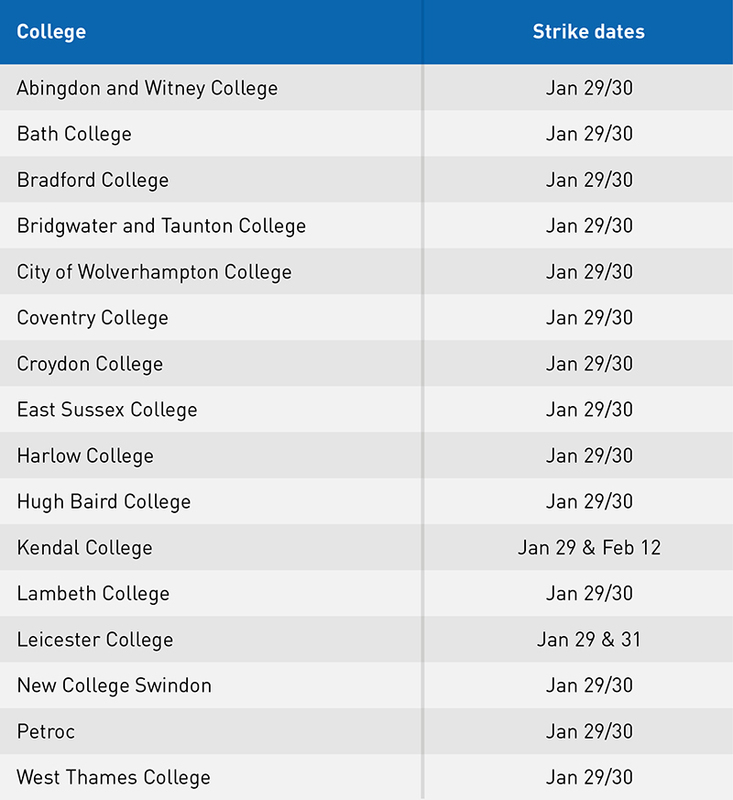 These were Abingdon and Witney College, Bridgwater and Taunton College, City of Wolverhampton College, Coventry College, East Sussex College, Harlow College, Hugh Baird College, Kendal College, Leicester College and West Thames College. They join Bath College, Bradford College, Croydon College, Lambeth College, New College Swindon and Petroc, which all took action in November and are scheduled to walk out for a second time. In December the AoC put forward an offer of one per cent, which the union described as a “wholly inadequate response” to the pay crisis in FE. Capital City College Group agreed a “landmark” pay rise for its staff of up to five per cent late last year – even though this would turn a projected break-even budget into a £2.3 million deficit.